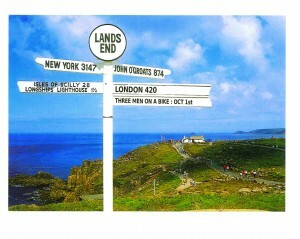 3 Men On A Bike (Lands End To London) – We did it! 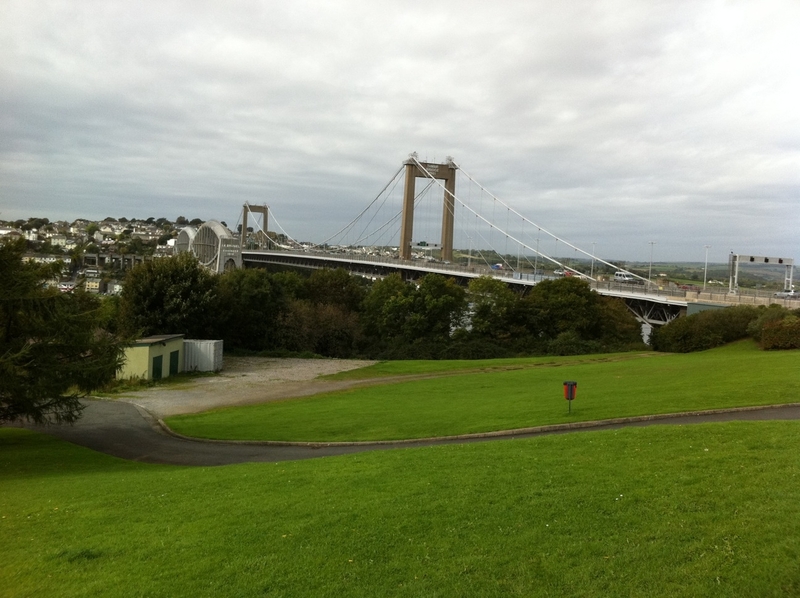 Day 8 – 420 miles – done! It seems like weeks ago that we were at Lands End in the pouring rain with a mountain (quite literally) ahead of us to climb. 420 miles seemed like an impossibility, but as I sit in a car driving out of London, Tower Bridge and now the Houses of Parliament on the right it’s only just dawning on us all what we have just achieved. More on this later. For now we need to finish off Day 7. Day 6 – Boys with their toys – 70 miles – done!! Some anticipation to this day from several quarters. However, we need to finish off Day 5 first. Dinner after the Nevada gig had been booked at Zizzi’s. 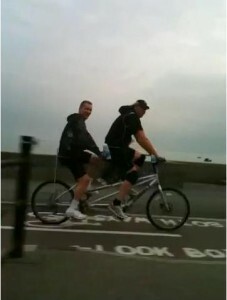 Simon and Terry (the Boyz from PMT) needed to settle pre-ride nerves with some pasta and sparkling water. This was just as well, as this useless restaurant (apparently they have 50 outlets) had no chicken and no meat!? The restaurant was packed…briefly. Anyway, having found something on the menu that could be served, the staff then preceded to outperform the Premier Inn restaurant crew with service that would have made poor Mr Zizzi turn in his grave. NB suggest you do not use this restaurant, EVER! Early night (not) and day 6 was upon us. 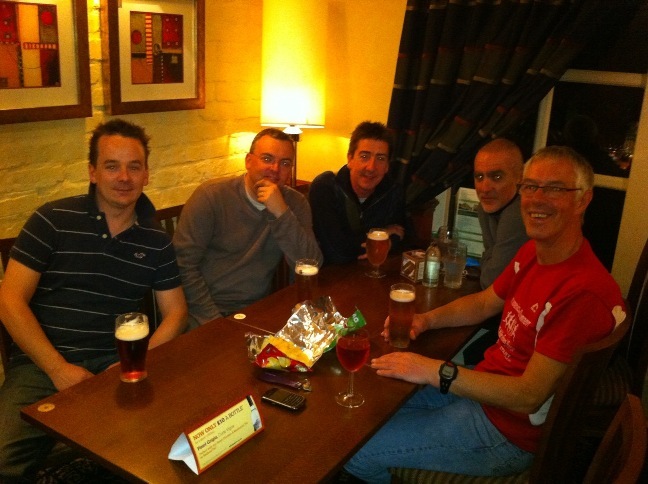 The Boyz were in for breakfast, slightly the worse for wear….must have slept badly! 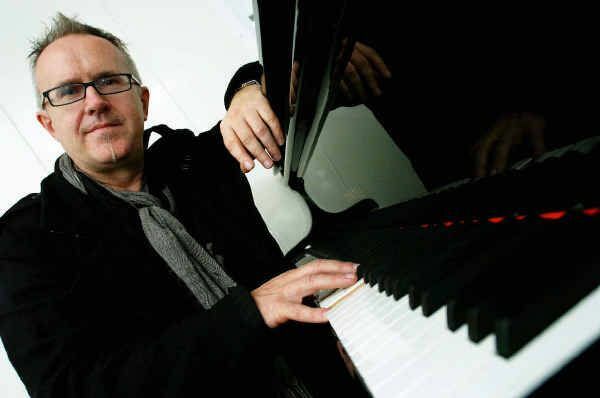 We got back late last night to the hotel after the gig with Howard Jones at Absolute Music and just caught last orders at the restaurant. What a relief as we were all starving. 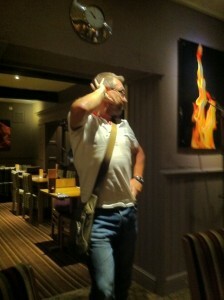 The waiters were clearly in no hurry to get home and I think it was at least 10.30pm when the starters arrived. After 58 miles that day, and no food since lunch this was somewhat challenging. Clearly this particular Premier Inn restaurant had missed the training day that covered the ‘premier’ bit. What day is it? Laundry day of course! Just as the we’re starting to get over the horrendous weather we’ve had so far, it’s a shame we can’t say the same for our kit, which is threatening to crawl to London on its own accord. A reprieve came in the form of Janine and Dean who whisked our kit off to the nearest laundrette to save our blushes for the next few days of the ride, only for Dean to whisk his own kit off a la Nick Kamen in the Levis 501 advert. 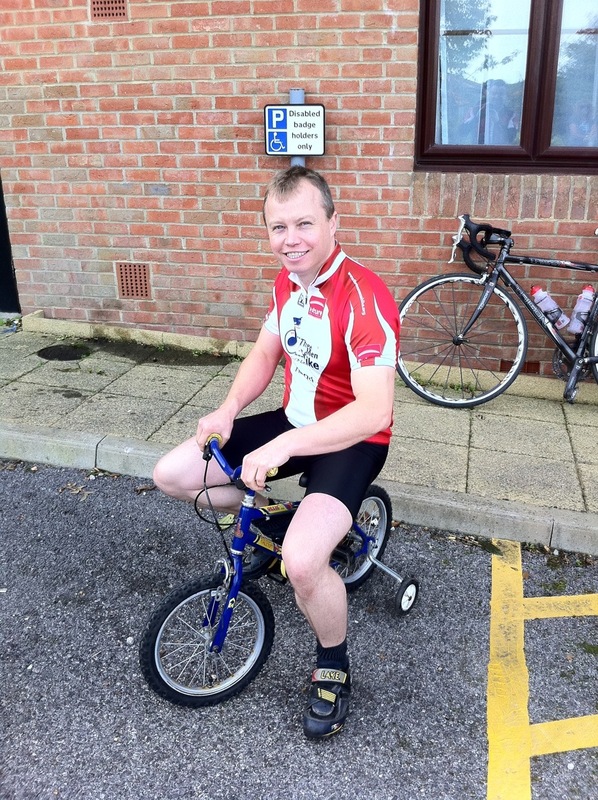 Day 4 – Chard to Poole – 58 miles – done! What fantastic hosts and a great place to stay. That evening they were running a local carnival committee fund raising quiz and Peter, characteristically, arrested the mic from the quiz master and got a Three Men plug in, filling one of our collecting tins. I hope they managed to save some change for their carnival. 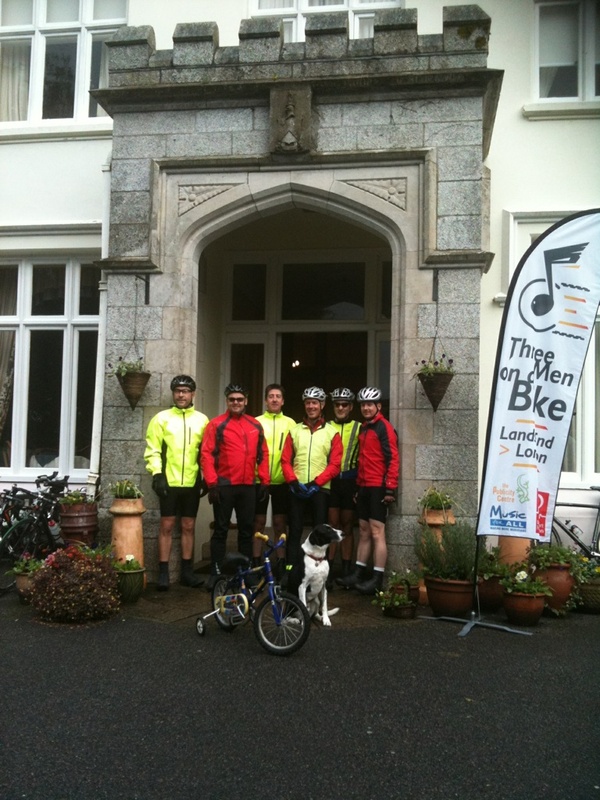 Day 3 – All Creatures Great and Small – 61 Miles – Done! Delightful stay at the Glazebrook hotel last night. A quiet hideaway (AA 2 Star), great owners and fantastic service. An air of some expectation hung over us at dinner last night. Even optomisticweather.com (Simon’s Russian iPhone weather app) wasn’t looking good. Day 3 was the highest elevation of the whole ride (just under 4000 ft / 61 miles) and pouring rain was promised. Great company and a team spirit got us through the evening, helped in no uncertain part by Rose’s laundry service (clean shorts for everyone, at last). 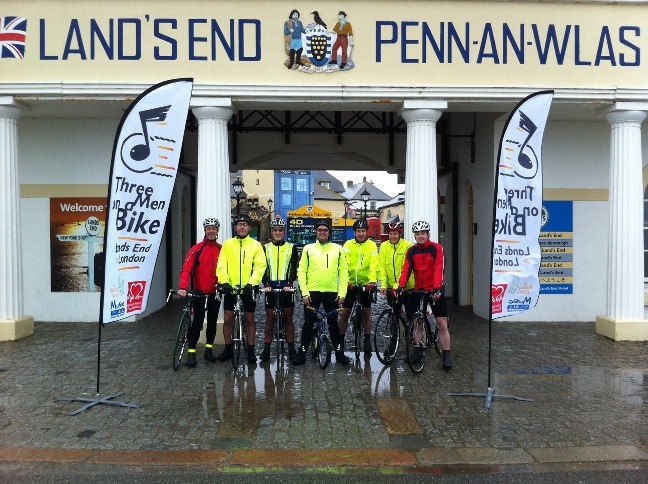 Day 1 – 60 miles – done! One wonders if it might have been slightly easier to stand under a cold shower all day! As I sit in the Premier Inn in Bodmin reflecting on the appalling day’s weather, the sun has just come out – it’s a cruel world! 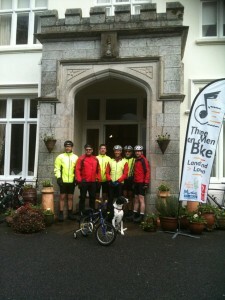 Despite the rain, the guys are ready for the off – see you in 60 miles! 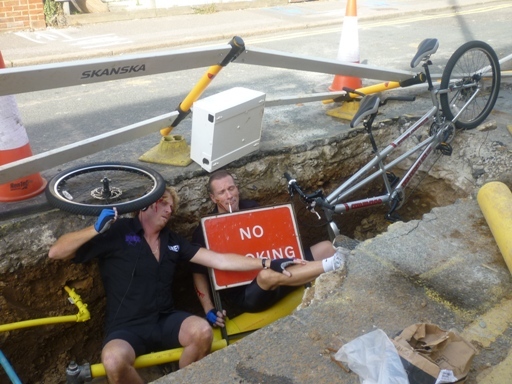 After the trauma of their “pot hole incident”, we’re delighted to hear that Simon and Terry from PMT are back on the road again and are training hard for the ride which starts at 10am this Friday Oct 1st. 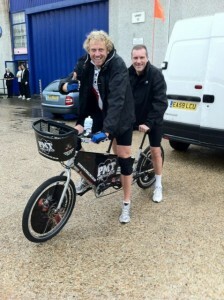 PMT crash out in charity bike ride horror! Simon Gilson and Terry Hope of PMT, who were hoping to take part on the October 6th leg of the Three Men on a Bike charity ride from Lands End to London, have been involved in an incident, seeing the pair crash their specially ordered tandem bicycle into road works in Southend town centre. 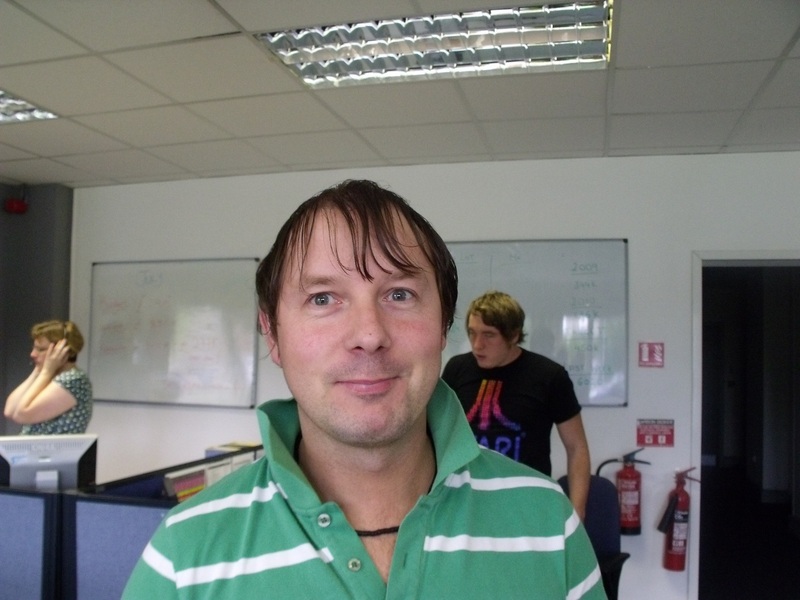 Andrew from sales support at Roland, decided to shave his head to raise money for Three men on a bike! Here is the photo evidence…he didnt bother to tell his wife beforehand though, whoops. Well done to Andrew. Over £50 raised for British Heart Foundation and Music for all. Howard Jones is joining the ride! The 80’s legend that is Howard Jones has agreed to be a guest peddlar on Three Men on a Bike! 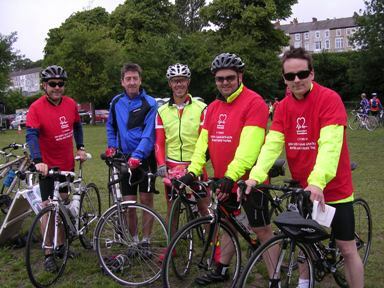 Despite wind and rain, the 3 men, plus guest rider James and trainer Terry all survived the Gower Bike Ride last Sunday for The British Heart Foundation. In total, we rode over 36 miles, although this is only half of what we need to do every day for 7 days! Just over 12 weeks to go and counting…! 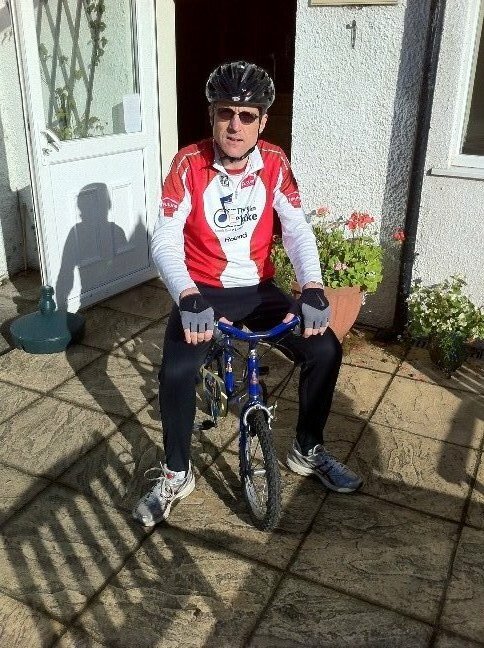 As the ride edges closer and the riders begin to feel the reality of the challenge set in, help is at hand in the form of Terry and Rose Jones, who will be putting the riders though their paces to ensure they can and will perform on the day! 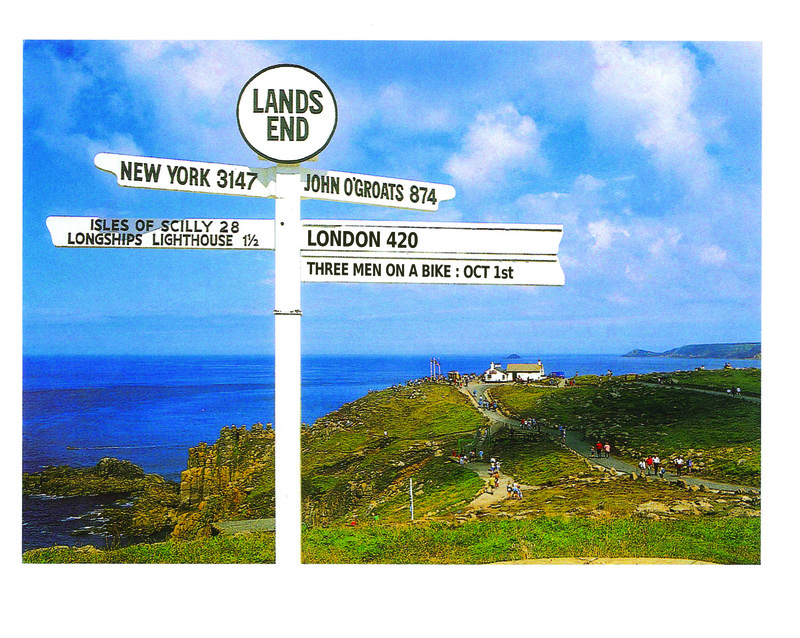 On the 1st October 2010 I will be saddling up for a bike ride from Lands End to London with my colleagues from Roland UK Peter Heath and Simon Griffiths.